A recent update to Google AdWords is changing the way performance marketers understand their landing pages’ Quality Scores. While Quality Score is a critical factor in your ad performance, it’s always been a bit of a mystery wrapped in an enigma. Marketers have never been able to natively view changes to Quality Score components in AdWords directly. 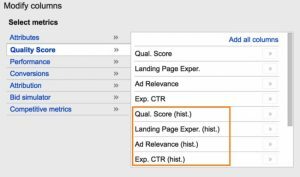 That is — even though expected click through rate, ad relevance and landing page experience scores are the elements contributing to your Quality Score, you haven’t been able to see these individual scores at scale (or for given timeframes) within your AdWords account, or export them into Excel. Which is why, up until now, some especially savvy marketers have had to improvise workarounds, using third-party scripts to take daily snapshots of Quality Score to have some semblance of historical record — and a better-informed idea as to changes in performance. Fortunately, an AdWords reporting improvement has brought new visibility into Quality Score components that could help you diagnose some real wins with your ads and corresponding landing pages. This is not new data per se (it’s been around in a different, less accessible form), but as of this month you can now see everything in one spot and understand when certain changes to Quality Score have occurred. Now, after you make changes to a landing page — you can use AdWords’ newest reporting improvement to see if you have affected the landing page experience portion of your Quality Score over time. This gives you a chance to prove certain things are true about the performance of your landing pages, whereas before you may have had to use gut instinct about whether a given change to a landing page was affecting overall Quality Score (or whether it was a change to the ad, for example). As agency marketers, we don’t like to assume things based on the nature of our jobs. We can now pinpoint changes to Quality Score to a certain day, which is actual proof of improvement. To show this to a client is a big deal. Overall, if your CPC drops, now you can better understand whether it may be because of changes made to a landing page. Prior to this AdWords update, ad relevancy, expected click through rate and landing page relevancy data existed, but you had to mouse over each keyword to get this data to pop up on a keyword-by-keyword basis. Because you couldn’t analyze the data at scale, you couldn’t prioritize your biggest opportunities for improvement. However, now that you can export this data historically (for dates later than January 22, 2016), you can do a deep dive into your campaigns and identify where a better, more relevant landing page could really help. You can now pull every keyword in your AdWords account — broken out by campaign — and identify any underperforming landing pages. Now, an Excel deep dive into your AdWords campaigns can help you reveal landing page weaknesses. You can break down which of your landing pages are above average, or those that require tweaking. For example, you might index your campaigns by the status AdWords provides, assigning anything “Above Average” as 3, “Average” as 2 and “Below Average” as 1. You can then find a weighted average for each campaign or ad group and make a call on what to focus on from there. What should you do when you notice a low landing page experience score? In short, it’s very important that your landing pages are highly relevant to your ad. Sending traffic to generic pages on your website may not cut it. Moreover, once you are noticing low landing page engagement scores, it’s time to try optimising these pages with some quick wins. Figure out what a user wants, and do everything you can to tailor the on-page experience to them. Whether that be [using] Dynamic Text Replacement, A/B testing elements to get the best user experience, or spending less time on technical issues and more on writing great content. Finally, for more on AdWords’ latest improvements, AdAlysis founder Brad Geddes has written a great article on Search Engine Land. His company had enough data on hand to attempt a reverse-engineer of the formula for Quality Score to get a sense of how changes to one of the QS components would impact overall score. Brad’s recommendation is much the same as Ross’: if a landing page’s score is particularly low, your best bet is to focus on increasing user interaction with the page.